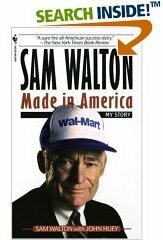 Sam Walton built the world’s largest retailer from a single store. He says that he wasn’t much of a rule-follower, but in the end, there were things that he did that he felt made him successful. In his autobiography, Made in America, he described ten things that worked for him. #1 – Commit to your business. #2 – Share your profits with all your associates, and treat them as partners. #3 – Motivate your partners. #4 – Communicate everything you possibly can to your partners. #5 – Appreciate everything your associates do for the business. #6 – Celebrate your successes. #7 – Listen to everyone in your company. #8 – Exceed your customers’ expectations. #9 – Control your expenses better than your competition. And his unstated bonus rule … #11 – Break all the rules!